Summers, Mangoes, Coolers- It can’t get more synonymous than this for me. We all have our own childhood memories of mom making some real refreshing coolers at home. For us, most often it was home made chaas/ buttermilk, the yummy liquid remnant after extracting the homemade butter. With a dash of salt, some ginger and green chillies’ paste, a chilled glaassful of this masala chaas would make the hot Hyderabad afternoons bearable. Next most popular was aam panna / raw mango cooler. Cooked mango pulp with jaggery has excellent refreshing and cooling properties , and was always in stock to be just mixed with ice cold water and guzzled to get a quick respite from sweltering heat. 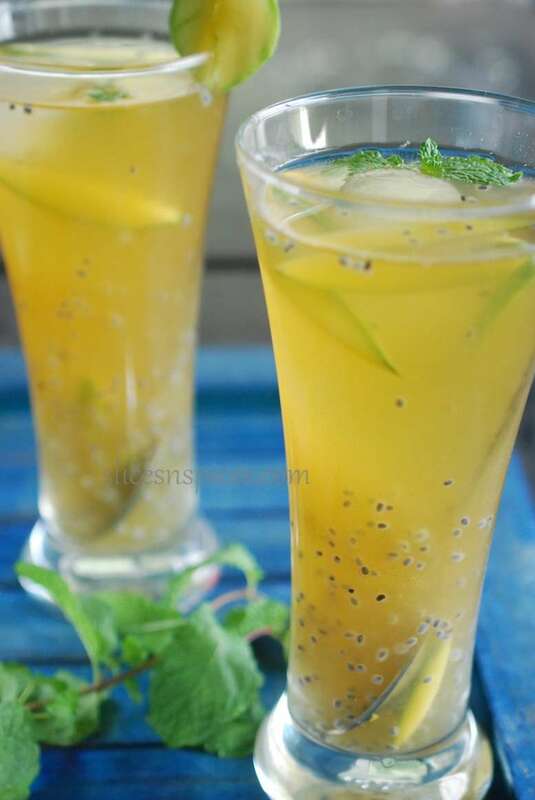 An iced green tea, with the tangy-sweet flavours of aam panna with some soaked basil seeds floating , is a perfect option in the hot summers. 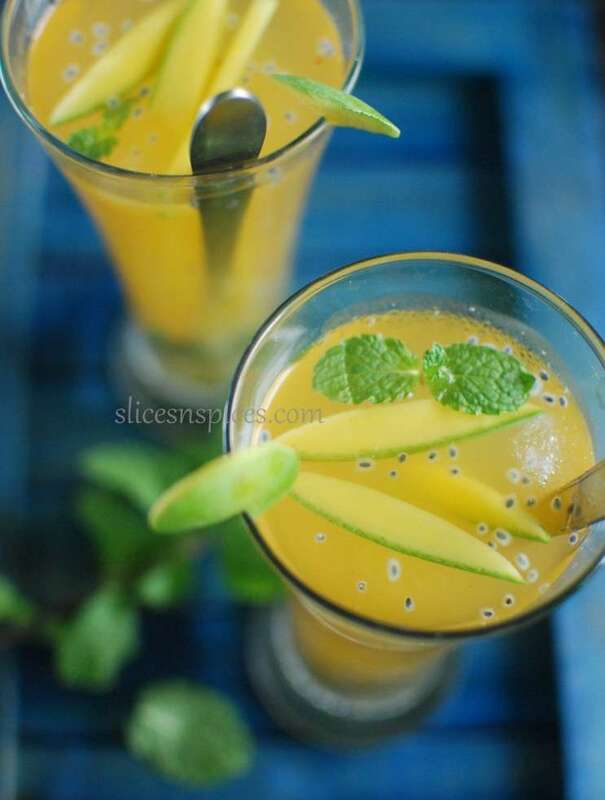 The fruity -tangy flavour of green mangoes, compliments the slightly bitter taste of tea, makes for a great option for evening gatherings. This drink has almost replaced my evening hot tea, light on stomach with a fruity punch. Heat water in a vessel, once it boils switch off the flame, drop in tea bag/ powder. Cover the vessel with a lid, allow it to cool. Pressure cook mango, you can also cook it in an open vessel adding water so that the mango is completely immersed. Let the mango cook for 10-15 minutes in boiling water. Switch off the flame, drain water. Once cooled , peel the mango, scrape out the pulp and keep aside. Once the green tea decoction has cooled down, add 2-3 tablespoons of mango pulp, roasted cumin powder, black salt, jaggery,pepper. 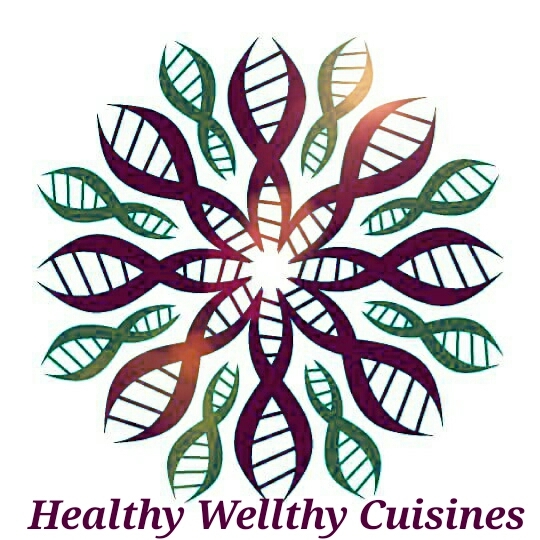 Mix well so that the raw mango pulp is no longer seen as lumps. Check the taste and adjust salt-sweetness accordingly. 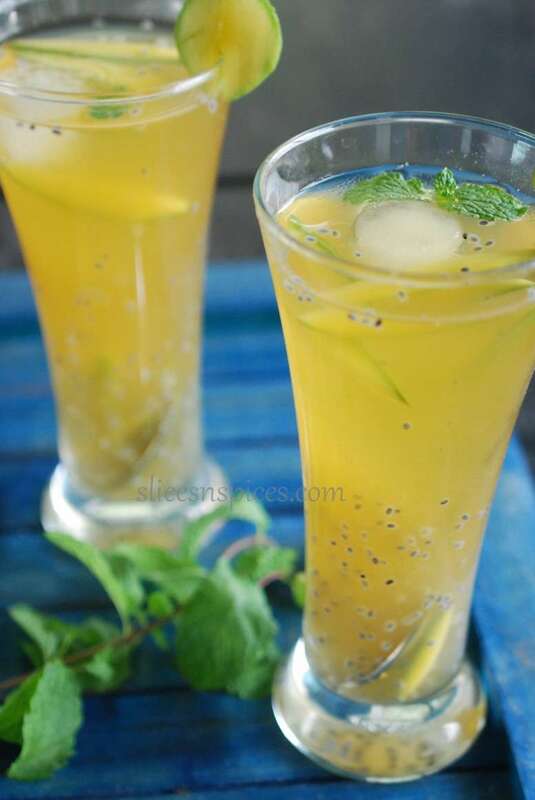 Take two tall glasses, add tablespoon of soaked basil seeds, few chopped raw mango pieces. Strain the green tea mango pulp mixture into the glasses. 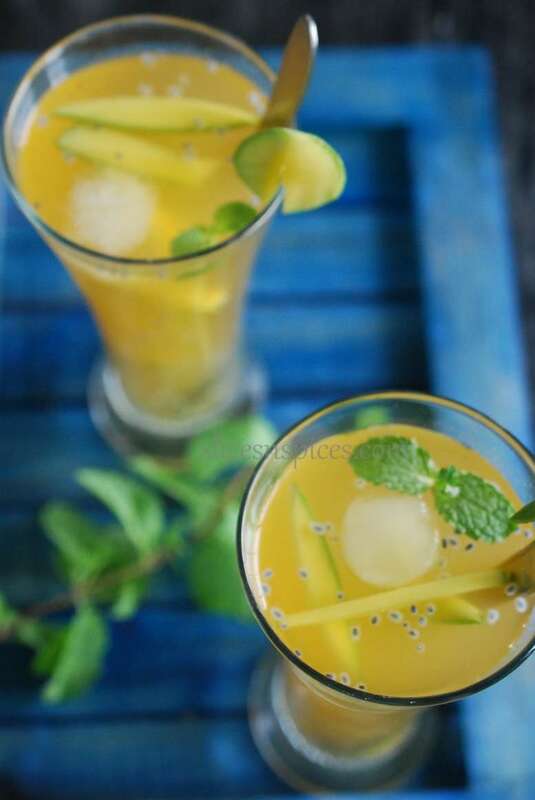 Garnish with mint leaves, serve chilled with ice cubes for a refreshing iced tea. Note: For kids, you can omit green tea decoction and just mix all the other ingredients in chilled water. You can stock mango pulp mixed with other ingredients in an airtight glass jar. Stays good for a week when refrigerated.